There is always new research going on in nutrition, and sometimes it can seem overwhelming to keep up with. One day canola oil is the most “heart healthy fat” the next day we find out that’s a lie the food and marketing industries have fed to us and that canola oil is GMO, inflammatory and should be avoided (1, 2) but butter is good for us, even though we were told not to eat that previously. AH! It can definitely be confusing. That being said, I think there are a lot of junk nutrition books out there, mostly people who just write about their own opinions without references to the peer-reviewed clinical research. So just because something is in a book, does not mean it’s true. However, there are a lot of amazing books out there trying to make people LESS confused about nutrition and basing their claims on FACTS. So here are some of my personal favorite nutrition reads of 2018 (note: not all of these books were released in 2018, they were just books I read during the year). Oh and PS… I usually listen to my books so that I can “read” while I’m driving, taking Claudette for a walk, doing dishes, cooking etc. So if you don’t have time to sit down and read, all of these came in audiobook form too! And none of this is sponsored, just my favorites. See below in alphabetical order. The author of this book was formerly a journalist who reviewed restaurants. However, as she aged and felt pounds packing on, she began avoiding the foods that all the best restaurants used (butter, meat, and cheese) only to find her weight increasing. This was frustrating to her, and once she started embracing the fatty foods in high end restaurants, she actually began losing weight. This prompted her to investigate the science between the low-fat-diet theory and whether saturated fat is really that bad for us. Nina takes a scientific approach at analyzing fat in the diet throughout history and throughout cultures and gives solid evidence as to why so many of our current dietary guidelines are misguided. It’s interesting to hear the evidence from a former restaurant-reviewer’s perspective. I personally loved a lot of the evidence about different tribal cultures, that I never would have known about, that live off of mostly fat and their various health markers. This book challenges conventional wisdom and is definitely worth a read! This book is admittedly the most “science-y” of the reads on this list. So if you aren’t into nerding out over nutrition science, I don’t recommend it. Perhaps this is why I loved it so much, but I admittedly had to take breaks while listening to it, and have “podcast days” where I’d listen to one of my favorite nutrition podcasts because my brain just could not handle the information in this book. Anyways, the book in a nutshell, is an in depth look at the gut brain connection. Perlmutter goes into what’s in our gut, how it works and how that impacts the brain. The book goes into everything from depression, anxiety, autism, ADHD, chronic fatigue, Alzheimer’s, dementia and other brain related disorders and how these relate to what’s going on in our gut. Perlmutter also offers actionable items about how to make sure your gut is in tip top shape! Reader beware - you will learn a lot but the information is dense. Perlmutter (who also wrote Grain Brain) is a renowned neurologist, lecturer and has been published extensively in peer-reviewed scientific journals (gold standard for research). So the guy is smart. Which, is why this book can be a little too “brain-y” for some people. This is definitely my favorite book I’ve read so far on gut health. As most of you have heard me say, the gut is truly the root of all health so it’s an important one! The book is not as science-y (I know that’s not a real word but hey, you know what I’m talking about) as Brain Maker or some of the other books on gut health. Axe makes the gut and gut health easy to understand for the average individual who does not have a science or nutrition background but he also offers a ton of great information so if you do have a background in either of those fields, you will learn a lot from the book. The book starts out with a personal story about how Axe helped his own mother beat cancer by giving her a gut-healing protocol. Josh also goes into a lot of the everyday things we do as a society to make us “healthier” and shows how these are actually harming us (hello hand sanitizer and avoiding dirt from pets). He gives actionable things anyone can implement through out the book, as well as little quizzes to help you evaluate your own gut health. I think most people could learn a lot from this book. Dr. Axe is a chiropractor, doctor of natural medicine and certified nutritionist. He’s young, vibrant, and knows a ton! I also love his products Ancient Nutrition (you have probably seen me post about them on instagram). Mainly, I trust his products because I know there is science behind them! This is another super informative book that starts with the author’s personal health journey. Liz takes you through her teens and twenties and a history of trying every fad diet, counting calories, hiring trainers, but nothing working. She then discovered the paleo diet through a trainer, and began feeling great. This prompted her to do her own research on our current national nutrition recommendations and what is truly healthy for us. She goes into the research and proves wrong so many conventional guidelines and tells you what you should eat and why. The book is in no way restrictive or didactic, it’s just informative and relatable. Liz also is hilarious (anyone who has listened to her Balanced Bites Podcast) knows this. So you’ll be learning and giggling the whole time. Liz Wolfe is a Certified Nutritional Therapy Practitioner, co-host of the Balanced Bites Podcast, mother and creator of the Balanced Baby-Making and Beyond program (which I have also done). This book is another great read for anyone, whether you are in the field of nutrition or not, you’ll get a lot out of it and laugh while doing it. If you are going to read ONE book on nutrition in your entire life, make it be this one. Dr. Hyman takes a no nonsense approach to clearing up all the confusion about nutrition. Each chapter covers a different topic and tells you what you should know about it. The chapters include “meat”, “poultry & eggs”, “milk & dairy”, “fish & seafood”, “vegetables”, “fruits”, “fats & oils”, “beans”, “grains”, “nuts & seeds”, “sugar & sweeteners” and “beverages”. Dr. Hyman tells you what you should look for, what you should avoid etc. and he does everything in laymen’s terms. This is the holy grail of eating for optimal health, in my opinion. The book shows you food is medicine, which is one of Mark’s core principles, but it also shows you how many of our modern food choices are perpetuating disease. He backs up all his claims extensively with research yet keeps it easy to understand (as I said). Dr. Hyman is opinionated, and that is a criticism of his work sometimes, but he backs his opinions up with facts so I like that he takes a stance on everything. I’ve recommended this book to clients, family members and friends and have gotten great feedback from all of them. You won’t leave feeling like you can’t eat anything, you’ll leave feeling empowered with knowledge. And, it’s a great resource to reference back to. Dr. Hyman is a practicing family medicine doctor, functional medicine doctor, and founder of the Cleveland Clinic Center for Functional Medicine, The UltraWellness Center and is on the board of the Institute for Functional Medicine. I also love his podcast, “The Doctor’s Pharmacy” in which he interviews guests that talk about various topics that show food is medicine. Another book written with a personal agenda at heart. Max Lugavere was formerly a film-maker and political journalist working for Al Gore’s TV station. However, when his mother’s neurological health started to degenerate (they later found out she had Alzheimer’s), he decided to switch gears and use his investigative background to research brain health and what the average person can do to preserve theirs. This book takes you on an informative narrative that might make you cry (hearing about him watch his mother decline) but at the same time gives you information about what you can eat for your own future as well as your loved ones. Lugavere specifically drills into what dietary patterns make our brains work, what can stop them from working, and how you can improve your own cognitive function even if neurodegenerative diseases run in your family. Max gives you his 10 genius foods that anyone can incorporate and even gives you some genius meal plans at the end of the book. Max’s narrative voice is young, and relatable. He teamed up with a neurologist to write the book, so there is plenty of scientific data backing everything up. Max also has a podcast, The Genius Life, that is one of my favorites. I have read this book two times in entirety and have gone back to reference it countless more times. It is a refreshing break from the outdated, under-researched, overly-restrictive nutrition guidelines given to pregnant women today. I really like my Obgyn, but I have to say I was extremely underwhelmed with the advice they gave to me around eating. In fact, I think it was just a sheet of paper with, you guessed it, some outdated advice that is not based on research (don’t eat sushi or deli meat or raw eggs) … well turns out not all of these things are bad for pregnant women, and many of them are actually good for pregnant women. There was also no information on what you should be eating during pregnancy (aside from folic acid, which is actually a less bio-available form of the B vitamin folate) more on all this to come in a separate blog post (3). If there is one thing Lily is good at, its RESEARCH. You can trust this book (probably more than your OB) because she gives you all the scientific data behind every single thing she recommends. I know my doctor doesn’t do that. 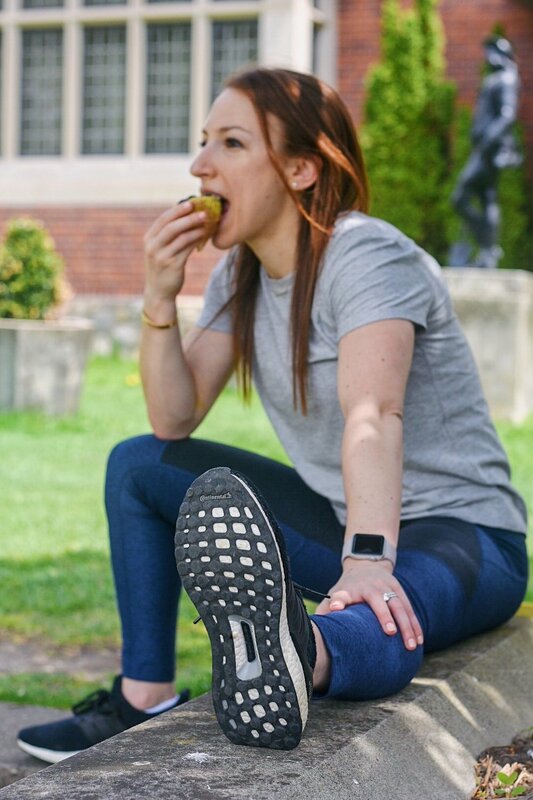 Although Lily is a Registered Dietitian Nutritionist, she goes by the data, like I said, which means she often challenges the advice given from the American Dietetics Association. Her unconventional approach is refreshing but also full of truth. So whether you are pregnant, or think you might like to be some day, you will learn a ton from this book. She goes into a whole foods approach for pregnancy (and provides meal plans at the end) and also has a chapter on exercise, which, I found extremely useful. Phytonutrients: comes from fruits and vegetables, specifically, these are the compounds that give fruits and vegetables their colors, so eat the rainbow! As I said, you don’t need all four PFFP components at every meal, but the more the better. The thing you want to avoid is having a meal or a snack comprised of “naked carbs”. Some examples of naked carbs would be (a piece of fruit, a bagel, some juice, cereal). Ways to “dress up” those carbs so they have more PFFP components and are not naked would be a piece of fruit with some nut butter or greek yogurt, a bagel with smoked salmon or an egg, a smoothie that includes protein and healthy fats (instead of a juice), and greek yogurt or cottage cheese with a granola that includes lots of nuts and seeds instead of cereal. The above examples all include traditional “breakfast fare”. However, breakfast does not have to include “traditional breakfast food”. It is more important to eat foods you like and will crave, are realistic and accessible to you at breakfast time. And of course, strive for as many components of PFFP as you can. I often eat regular “meals” for breakfast if that’s what I wake up craving and I have leftovers in the fridge anyways. For instance, I love a good “breakfast salad” like the one pictured to the right. Nothing like starting your day with greens. Or sometimes I’ll have something from dinner the night before such as salmon and roasted veggies (hello PFFP). 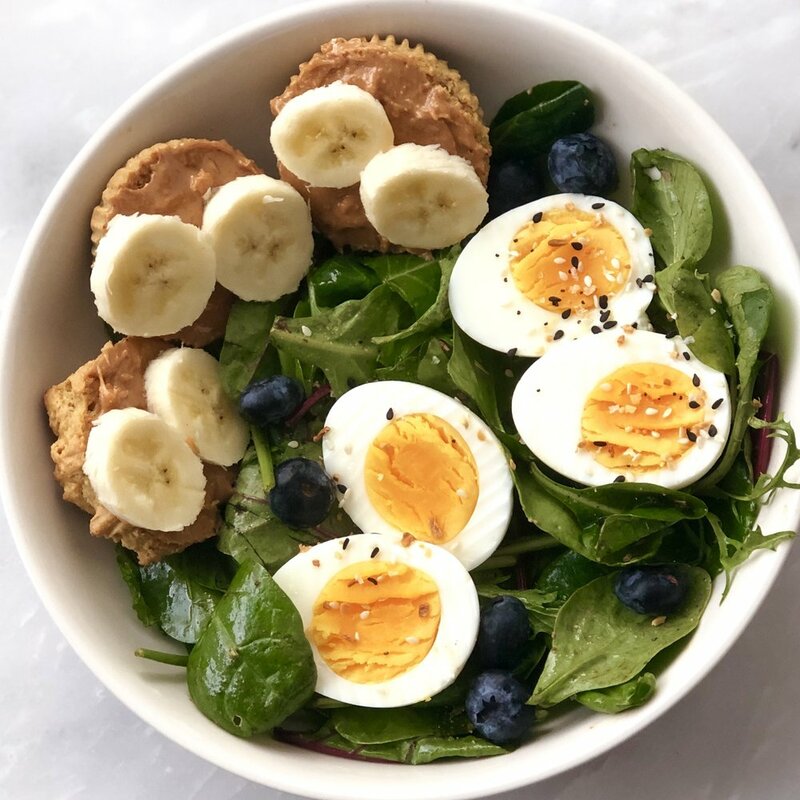 Breakfast foods can feel constraining to people when they don’t know what’s healthy and convenient in the breakfast category, the default can be to just grab coffee and skip breakfast, or grab a packaged protein bar and be on your way. But when we think about breakfast in narrow terms we can get pigeon-holed into the naked carb items above (cereal, bagel etc.) By expanding our definition of what’s “allowed” at breakfast, the possibilities are endless! For most people, mornings can be the busiest time of day. Hence the tendency to skip breakfast. Plan ahead and plan realistically. If you love a cozy bowl of oats, make a batch of overnight oats on the weekend that’ll be read for the week. If you love omelettes and bacon, make egg muffins with your favorite bacon chunks in it ahead of time. If you love pancakes or waffles, make and freeze a big batch so they can easily be reheated during the week. If you’re a smoothie and go type, put your smoothie ingredients in individual bags so all you have to do is dump them in the blender when morning arrives. You can check out more of my “meal-preppable” breakfast recipe ideas here. Waking up is hard enough, no matter how much sleep you got the night before. So why not have something to look forward to in the morning. You should always start your day with something delicious you want to eat. Not only will this set the tone for the day in a positive way, but it will make you more likely to eat breakfast. Instead of preparing foods you feel like you should eat for breakfast, start your day with foods you get to eat for breakfast! More recipes & fit tips please! Subscribe to get Charlotte's latest recipes and nutrition/fitness advice straight to your inbox.